Before Pittsburgh Steelers’ quarterback Ben Roethlisberger had three children of his own, he had actually had a few hundred. Big Ben started hosting his annual youth football camp before becoming a father and he continues the tradition later this month. 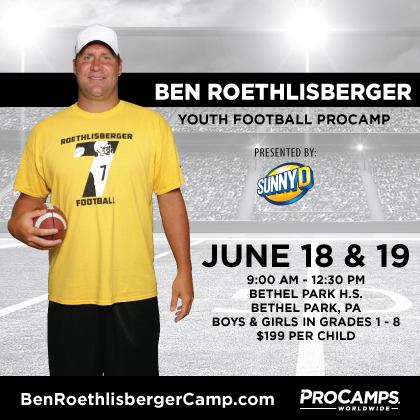 The Ben Roethlisberger Football Camp takes place June 18th and 19th and is open to both boys and girls in grades 1st through 8th. It will be held at Bethel Park High School in Bethel Park, PA. The camp on Saturday the 18th runs from 9am to 12:30pm and then on Sunday the 19th it runs from 1pm to 430pm. Kids are organized into groups based on age and are put through numerous stations where different skills are taught and then worked on. Along with Big Ben, there are camp coaches at every station and there will also be numerous games and contests on both days of the camp. I’ve participated and witnessed camps put on by professional football players and sometimes there’s an opinion that that the athlete really doesn’t get involved. That’s actually a fair assessment but from everyone I’ve talked to, they say Roethlisberger is as involved as any pro athlete they’ve seen. I’m hoping to be there this year and check out the action for myself. Either way I highly encourage you getting your youngster there! 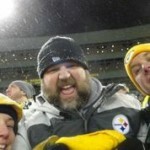 Did Martavis Bryant’s Agent Go Rogue?